The haematology department delivers a comprehensive service to patients with a wide range of blood abnormalities. 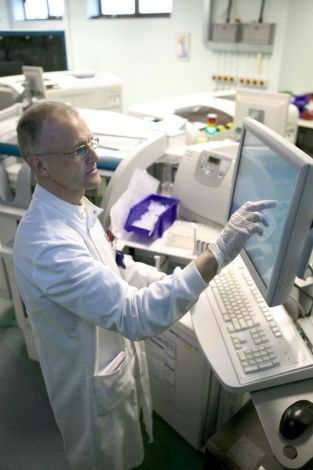 Haematology investigates the cellular components of blood and bone marrow mainly red cells, white cells and platelets. These various cell lines are counted by sophisticated analysers to help determine a patients condition or to monitor a pre existing one. The department also measures coagulation factors looking for conditions such as Haemophilia. Regular anticoagulant clinics are carried out to monitor patients on warfarin. The transfusion department provides blood for routine and emergency surgery as well as dealing with trauma cases in A+E. This process involves performing a blood group on the patient and screening the patients plasma for irregular antibodies before matching them with a donor unit. The laboratory is open 24 hours a day, 7 days a week. Outpatient services are provided between 9AM-5PM Monday - Friday. 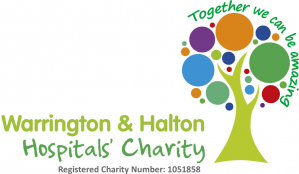 The Haematology department is based on the first floor of Appleton wing on the Warrington site and also operates a satellite laboratory on the Halton site. Two Haematology clinics and three anticoagulant clinics are carried out in the out- patients department each week. The Programme Investigation Unit provides a day ward for patients that need to be admitted for blood transfusion, platelet transfusion, chemotherapy, i.v. therapy, venesection and clotting factor replacement. Outpatient referrals are all seen by either the Consultant Haematologist, Associate Specialist or Senior House Officer. If you have been to your GP and have a unique booking reference number you can log in to the Choose and Book system to view your choices. However, GPs will still refer patients directly to the Haematologist via a letter, telephone call or a fax. IMPORTANT - Your rights and responsibilities in fulfilling an NHS appointment. It is essential that you are fit, willing and able to proceed to your appointment. Your referral request or outpatient appointment may be subject to change. If as a result, there is any change to your appointment this will be directly communicated to you and your GP via the appointment department. Your appointment is important and the outcome may have a bearing on your health. Should you need to postpone, please inform the appointment department at least 48 hours beforehand, so that we can rearrange. Should you leave this to the last minute before telling us, you may be asked to return to your GP. If for any reason, you fail to attend your appointment without notifying us, your referral will be returned to your GP and you will need to start again. If you decide you do not want to proceed with your referral, it is absolutely essential you cancel your appointment otherwise a Telephone Appointment Operator will continue to contact you. If you are leaving surgery with a Choose & Book offer that you need to confirm into an appointment by phone or the internet, please remember this offer has an end date. Should you not confirm an appointment date in a timely fashion, you may find the opportunity is withdrawn. If you find you cannot attend clinic for several weeks because you are, for example, going on holiday, confirm your appointment on your return when you are certain of your availability. If this is the case please ensure you tell your GP in advance. Ensure you bring a list of all your current medication to your appointment. You need to arrive 30 minutes before your appointment time when a blood test will be taken so that the Consultant has the most up-to-date blood results available for your clinic appointment.